Following the introduction of the new vocabulary, you’ll hear the words and structures again, this time in the context of a series of actions. Embedding the material in action sequences provides not only additional practice opportunities, but also a rich context aiding the brain as it processes and stores information into memory. You’ll see the entire sequence enacted, then you’ll have the opportunity to use gestures to “act it out” on your own. This process works so well that students often remember the associations long afterwards. On those occasions when you feel unsure about anything you’ve heard, you may simply rewind the DVD and watch the appropriate part as needed. With Excelerate SPANISH, it is easy for you to work at your pace! Excelerate SPANISH is ideal for the independent learner, but these lessons also make great public/private school sub plans, unit studies, and more. The helpful video component provides the necessary instruction for each lesson. 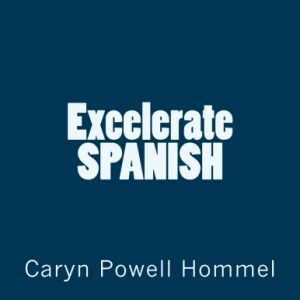 The Excelerate SPANISH lesson book, Excelerate SPANISH Workbook, and Excelerate SPANISH Answer Keys (all sold separately) are a wonderful complement to the videos. Also, to help you get plugged into many more outlets for additional resources and practice, there’s the Excelerate SPANISH page on facebook. Visit it often for links to videos, ebooks, news in Spanish, even resources to help you chat with native speakers. So now you have it… a way to learn Spanish that feels natural, because it is. Tools to help you achieve your goals. Support that you can count on. And a full 90 Day, 100% Satisfaction Guarantee. Excelerate Spanish. Order today! I really like the way several styles of learning are used. The workbook doesn’t always have the answers spelled out – my kids have to do some thinking to figure out some of the answers. I like the active, visual and auditory teaching. We review/rewatch the videos after time has passed. I love the way my boys are learning conversational Spanish after the first lesson. They are not pros -but they are learning quickly. My sons are active learners, often good at memorization, teenagers, and this is a good program. I am also recommending it to my sister. My nephew is 5, loves learning, and I think the same program will work for him. Amazing to be able to reach such a vast range in ages! They are funny too! So far there is a bit of humor in the stories. This motivated me to do some stuff on our own – we watch familiar movies in Spanish, with English or Spanish subtitles, and we check out spanish children’s books from the library, or find them on you-tube or Kindle and I have them teach the books to each other. This teacher is amazing and has inspired creativity in me. Ann, thanks so much for your encouraging comment. I hope that your students will continue to thrive and progress and amaze you! I love that you are getting creative and introducing additional comprehensible input for your family. Way to go! Keep up the great work.